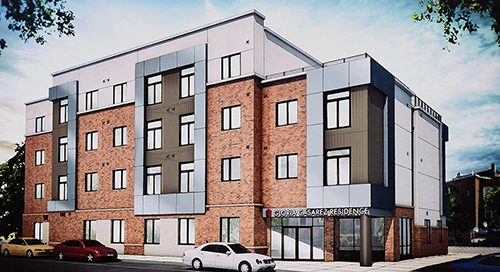 Gloria Casarez Residence is a new, LGBTQ-friendly young adult community with 30 one-bedroom apartments in Philadelphia’s Ludlow neighborhood. Located at 1315 N. 8th Street, the building is currently under construction and not open to the public. All units are for individuals between 18 and 23 years of age upon move-in. 25 units of the units are subsidized through the Philadelphia Housing Authority (PHA) and are for individuals who are homeless, formerly homeless, or at risk of homelessness (including individuals aging out of foster care) with annual income between $4,800 and $36,720. Rent for these units rents will range from $25 to $820. Electricity is not included. Four units are not subsidized through PHA and are for individuals with annual income between $24,481 and $30,600. Rent for these units is $820/month, electricity not included. Four of the 30 units are for individuals with mobility impairment and two of the 30 units are designated for individuals with sensory impairment. Full-time students are only eligible under certain circumstances and should contact us for more information. Maximum household size is two persons. This is a smoke-free, drug-free, and alcohol-free residence. Applications must be complete, postmarked by September 15, 2018 in order to be processed and sent by email to gloriacasarezresidence@projecthome.org or you can dial 215-309-5227 where you will hear a voicemail/e-mail reply with detailed information about the project. Applications will be processed in order determined by lottery. If you have any questions that are not answered above, please reply and we will get back to you as soon as possible. Thanks!